This happens because the roots of the teeth contain thousands of tiny tubules, or channels, leading to pulp, or the tooth’s nerve center. Various stimuli can travel through these tubules to reach the nerve in your tooth when the covering on its roots becomes exposed by receding gum tissue. A hard outer layer of enamel protects a material called dentin, which is what the inside of your tooth is primarily made up of. The dentin extends down to the root of the tooth and is protected by a layer of cementum. When dentin loses its protective covering of cementum, this exposes the nerve endings to things like cold, hot, or acidic foods, resulting in the pain you experience. According to the Academy of General Dentistry, some 40 million American adults experience tooth sensitivity, so if you’re one of them, you’re certainly not alone. Of course, that doesn’t make the suffering any easier. 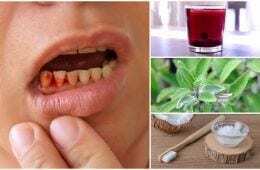 What might, is that there are a number of natural and effective home remedies that can instantly relieve those sensitive teeth, including these. Most of us are aware by now of the many different health benefits of coconut oil, but few realize just how great it can be for oral health too – not only can it be used to remove bacteria, promote healthy teeth and gums, and help teeth become less sensitive, but it can make your teeth whiter and brighter. Oil pulling is an age-old remedy that uses natural substances to clean the teeth and improve both tooth and gum health. It’s actually rather simple – the basic idea is to simply swish coconut oil around your mouth for a short time every day. The oil can cut through plaque and remove toxins and bacteria from the gums. While other oils can be used, coconut oil is arguably the best and has become the preferred option in the western world. It’s even effective for fighting off streptococcus mutans bacteria, which is known to cause cavities. Coconut oil pulling means that you don’t have to worry about harmful chemicals, it doesn’t taste bad as compared to other oils used for pulling, it’s inexpensive and readily available, plus, it’s easy to use. Liquify a tablespoon of coconut oil and put it into your mouth. Do not swallow the oil afterward, as it will contain harmful bacteria that was in your mouth. Instead, spit it out and then rinse well with warm water. After you’ve thoroughly rinsed, brush your teeth, gently, as usual. Aim to do this at least once a day, ideally in the morning. Salt water can also help relieve tooth sensitivity fast. It not only improves the pH balance of the mouth to create a more alkaline environment in which harmful bacteria are unable to survive, it’s a natural antiseptic to reduce plaque buildup, delivering what you might call a special two-for-one deal. To use a salt water rinse, add two teaspoons of sea salt to warm water and mix well until the salt is completely dissolved. Rinse your mouth with this solution twice each day, morning and night, to reduce sensitivity and pain. There are a number of essential oils that can be used to improve the health of teeth and gums while decreasing sensitivity, but the top 3 most powerful are peppermint, clove, and cinnamon essential oil. Peppermint is an antiseptic essential oil that can kill anaerobic bacteria to prevent gum disease as well as help ensure the dentin’s protective covering remains intact. Plus, its cool minty flavor makes it the best oil for fighting bad breath. To use it, simply add a drop of peppermint essential oil to your usual toothpaste. Or, make your own homemade paste by combining equal parts of baking soda and coconut oil, and then adding 10 to 15 drops of pure peppermint oil. Clove oil contains powerful germicidal properties and can also help numb pain while keeping the teeth and gums healthy and strong. Cloves have widely been used in dentistry for their anti-inflammatory, anesthetic and antibacterial properties that help reduce tooth pain and fight oral infections. In fact, a 2013 study published in the Avicenna Journal of Phytomedicine showed that an aqueous extract of cloves had an analgesic effect, making it beneficial for reducing tooth sensitivity and toothaches. When clove oil is mixed with orange essential oil, it creates an even more potent solution for soothing sensitivity teeth. As clove essential oil is very strong, and can actually burn, it’s essential to always dilute it with a carrier oil first, such as coconut or almond oil. The best way to use it for relieving teeth sensitivity is to combine one drop of pure clove oil and one drop of pure orange essential oil with 4 drops of a carrier oil. Cinnamon oil renowned for its antibacterial properties that can fight tooth decay-causing bacteria and prevent teeth from becoming overly sensitive. You can simply add a drop or two to your usual toothpaste and brush as normal, or make your own, in this case, by combining equal parts of baking soda and coconut oil, and then add 10 to 15 drops of pure cinnamon essential oil. Most of us are aware of the health benefits guava fruit can offer, but few realize that guava leaves provide multiple medicinal properties. In fact, research from the School of Pharmaceutical Sciences at Vel’s University in India published in the International Journal of Pharma and Bio Sciences, demonstrated that guava leaves contain flavonoids like quercetin, kaempferol, and rutin that offer anti-inflammatory, analgesic properties and free-radical scavenging activity that helps to relieve tooth sensitivity and toothache. The leaves are highly recommended by Ayurveda, particularly when suffering from sharp pain related to tooth sensitivity. This remedy is simple too, you can either chew up one or two fresh guava leaves for several minutes and then spit them out or use them as a rinse. To make a rinse, place 4 to 5 guava leaves in a cup of water in a tea kettle or a pot on the stove. Boil the mixture for 5 minutes, allow it to cool enough so that it doesn’t burn your mouth, add a sprinkle of sea salt, and then use it as a mouthwash. While garlic isn’t going to do your breath any favors, it offers a number of compounds that are beneficial to oral, and overall, health, including allicin, a powerful antibacterial agent and a natural anesthetic. It can help relieve pain resulting from tooth sensitivity, and even problems as serious as an abscess infection. It also helps kill the germs that cause oral infections and cavities. If you’re worried about bad breath, after using this remedy, simply chew on a couple sprigs of parsley, is does the trick amazingly well. To use garlic to decrease sensitivity and soothe pain, make a paste by combining one crushed garlic clove, 2 to 3 drops of water and about a half-teaspoon of sea salt. Apply it directly onto the affected teeth. Allow it to sit for a few minutes, and then rinse with warm salt water. Repeat twice daily as long as needed. You can also utilize garlic another way – cut a clove in half, and then gently rub the cut side against the affected teeth for about 10 minutes. Afterward, rinse with warm salt water. Repeat two or three times each day, or as needed. Onion has an effect that’s similar to garlic and contains flavonoids, including quercetin, that is known to offer anti-inflammatory properties, which can soothe the pain that results from tooth sensitivity. Its antimicrobial compounds also help to kill harmful bacteria in the mouth that can lead to an oral infection. Cut a piece of onion to a small enough size that it will easily, and comfortably fit into your mouth. Place the onion slice on the affected teeth, and hold it there for at least five minutes. The antiseptic properties of the onion will kill the bacteria in the mouth, which contributes to the pain. After taking it out, thoroughly rinse your mouth with salt water to prevent onion breath – if needed, as with the garlic, you can chew on a couple of parsley springs too. Repeat 2 to 3 times each day as necessary.